The noted economist says the GDP growth rates in the emerging economies have fallen since the countries have failed to implement second generation structural reforms. The BRICS grouping, which consists of Brazil, Russia, India, China and South Africa are facing a midlife crisis, noted economist Nouriel Roubini wrote in a World Economic Forum blog. While noting that China’s GDP growth rate may fall to below 7 percent and India’s may be just about 5 percent, the economist predicted sluggish growth for Russia, Brazil and South Africa. “I forecast mediocre growth of 1.8% in Brazil, 1.7% in Russia and 2.6% in South Africa,” Roubini wrote in the blog. The economist added that Brazil, India and South Africa are part of what investors consider the “Fragile Five emerging market economies” along with Turkey and Indonesia. “These fragile emerging markets share weaknesses, such as large current account deficits, large fiscal deficits, falling growth, rising inflation and political and policy uncertainty, and they all face parliamentary or presidential elections this year,” he wrote. He wrote that state capitalism “may have worked at earlier stages of development and during the global financial crisis, which had prompted a fall in private spending, but it is now distorting economic activity and leading to a fall in potential growth, as investment becomes less efficient.” Roubini also wrote that the commodity super-cycle was probably over and affected countries like Russia, Brazil and South Africa the most. “Given the slowdown of China, after years of high prices, commodity prices may fall further, hurting the growth of the commodity-oriented BRICS,” Roubini wrote. Although the economist also said BRICS may end up in the middle-income trap, failing to progress to a higher per capita income, he offered hope for the members of the grouping. “Of course, in spite of their recent economic difficulties, one should not be too pessimistic about the prospects of the BRICS. There are many reasons to be optimistic about their prospects for future growth,” Roubini wrote. He wrote that they were all large economies with large populations and markets, “and three out of five still benefit from a demographic dividend.” Roubini is also optimistic that the members would shed the model of state capitalism and implement structural reforms. He added that none of the members face the risks of severe currency, sovereign or external debt crises. “Future success will depend on fixing macro-imbalances, implementing appropriate structural reforms, strengthening weak political and other institutions, shedding state capitalism and opening up further their economies to global trade and investment,” Roubini concluded. 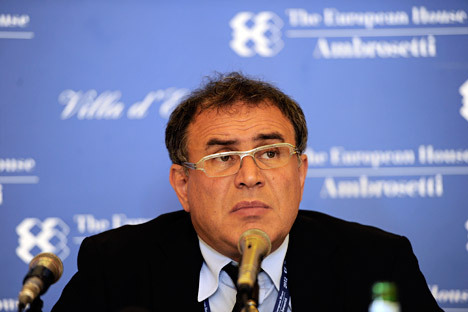 Nouriel Roubini anticipated the collapse of the United States housing market and the worldwide recession which started in 2008.